Automotive dealership departments and manufacturers share a common challenge in terms of storage, distribution and sales of parts. To overcome these challenges, many suppliers are taking benefit of filly automated vertical storage systems to considerably improve customer satisfaction and achieve higher profit margins from both their service and parts departments. Most of the automated dealers are now opting for vertical storage systems within their part departments, which, in turn, will spur the demand in this market. Similarly, increasingly stringent legislations and the demand for a secure and safe inventory are pushing companies in the pharmaceutical and medical industries to implement lean inventory and logistic models. Medical device and pharmaceutical industries are looking at every possible way of cost optimization, which, in turn, is diving the demand in the vertical lift module market. On the basis of delivery type, the global vertical lift module market has been segmented into single delivery and dual delivery vertical lift modules. Among these two, the single level delivery vertical lift module segment accounted for a 68.4% share in 2017 in terms of value. The dual level delivery segment of the vertical lift module market is expected to grow and account for a sizable share in the overall vertical lift module market by the end of the forecast period, owing to the high demand from automotive and machine heavy equipment. The Europe vertical lift module market accounts for a value share of 37.7% in 2018 and is projected to maintain its dominance in the global vertical lift module market during the forecast period. The North America vertical lift module market is projected to represent a significant incremental opportunity between 2018 and 2026 and expand at a significant CAGR in terms of value and volume over the forecast period. Sales of vertical lift modules in MEA is projected to represent a total incremental opportunity of US$ 29.0 Mn between 2018 and 2026, while the MEA vertical lift module market is projected to expand at moderate CAGR in terms of value over the forecast period. 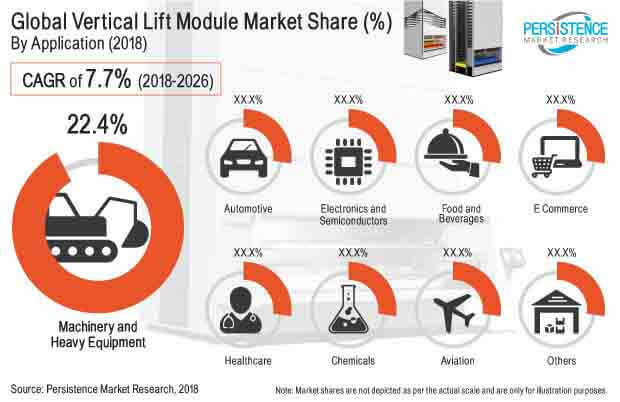 Some of the market participants reported in this study of global vertical lift module market include Hanel GmbH & Co. Kg, Modula Inc., Weland Lagersystem AB, EffiMat Storage Technology A/S, DMW&H, Automha SPA, ICAM Srl, Daifuku Co. Ltd., Kardex Group (Remstar), Systems Logistics SPA, Schafer Systems International, Inc., Ferretto Group S.P.A. and others. Prominent manufacturers of vertical lift modules are found to be involved in the development of new and innovative vertical lift modules and acquisition activities to enhance their market presence across the vertical lift module market. Also, a well-structured and efficient supply chain along with an improved retailing network for vertical lift modules are the major growth strategies being opted by vertical lift module manufacturers for reaching out to customers. Hanel GmbH & Co. Kg.